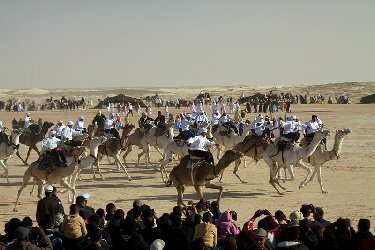 The International Festival of the Sahara in Douz is an annual festival in Tunisia. The very first festival, called the Camel festival, began in 1910 when Tunisia was under French rule. Since then, every year at the end of December for four days, thousands of people, mostly from all over Tunisia and other Maghrebien countries flock to Douz. After the official opening ceremony, the main events take place in the H'naiech stadium in front of the desert surrounded by Bedouin tents. Camel marathons, fantasia- galloping Arab horses ridden by daring riders, a Bedouin marriage, sloughi desert hunting dogs - catching rabbits are the principal features. In the evening, groups from visiting countries perform popular songs and dances. The central event is the annual poetry contest run by the famous desert poet, Abdellatif Belgacem in order to keep poetry alive, which represents the desert's principal communication medium. 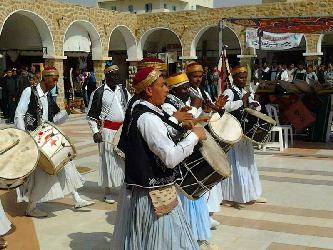 At the festival of Ksour, you can enjoy some fine local music and dance performances. The ghortas (grain stones) created by weathering resemble huge mushrooms, and the inhabitants carve their dwellings out of the sandy rock. Witness some fine music and dance, and follow the natives' lead by sleeping in underground rooms away from the heat. On visiting the place, you might some similarity between the galaxy scenes from the George Lucas famous film Star Wars and the lunar-like landscape of Tunisian desert. The Carthage Film Festival is a biannual October film festival hosted by the government of Tunisia. It alternates with the Damascus International Film Festival. It is a meeting place for international film industry professionals. An average of 200,000 tickets are sold over a period of ten days. A crop of films are selected from around the world for every year to satisfy the most demanding movie buff. The festival is also an opportunity for meetings and debates of current topics. Rooted in its Arab and African specificities, this meeting of filmmakers, producers, critics, moviegoers from the North and South has combined an abundance of films, the spirit of closeness between professionals and film buffs and a real sense of partying. The grand prize is the Tanit d'or, or "Golden Tanit," named for the lunar goddess of ancient Carthage; the award is in the shape of her symbol, a trapezium sumrounted by a horizontal line and a circle.